Good economy in fish farming is dependent on several factors, one of which is using the right feed. Initially, the task appears simple; get hold of datasheets from the feed producers and compare them to their quotation and delivery conditions. You then get an overview of where to get the most from your money. Unfortunately, it is not that simple. High declared values, for instance for the content of protein and energy, is no guarantee for good feed performance. It is crucial that the feed is composed of the correct nutrients, in the right ratio and with high digestibility. This information cannot be found on the data sheets. The datasheets declare the content of for example protein, fat and NFE/Carbohydrates. However, this information cannot stand alone when choosing feed for your farm. In relation to growth, the fish needs protein for building muscle, i.e. filet. Protein consists of amino acids, and to ensure optimum growth the fish needs a variation of amino acids in a certain ratio. If the ratio is out of balance, the amino acid in relative deficiency will be the limiting factor for fish growth. This is popularly known as “Law of the minimum”. 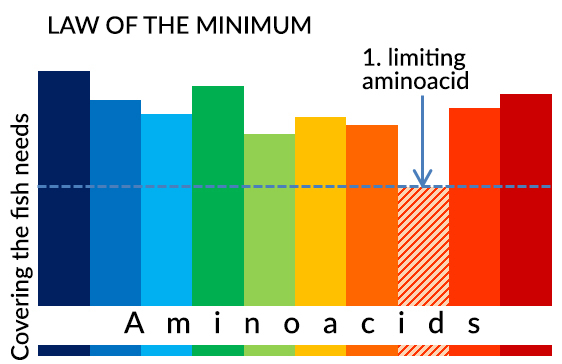 You cannot derive from the declaration on data sheets and labels whether the amino acid profile of the feed is correctly balanced. Take for instance a declaration of 45% crude protein. This is basically just an information that the feed contains 7,2% nitrogen. The explanation for this is that it is internationally defined that crude protein contains 16 % nitrogen. An analysis for crude protein is really just an analysis for nitrogen, subsequently calculated into crude protein. Thus, the result of the analysis is called crude protein. The declaration of crude protein therefore does not say much about the amount of amino acids and nothing at all about the balance or digestibility of these. These factors are crucial for the fish utilisation of the protein. Fat is the primary source of energy in the feed, and this declaration is somewhat more useful. Whereas the digestibility of fat can vary, the variation is limited unless we are dealing with feed with large amounts of fat with high melting point and thus low digestibility, such as fat from palm oil or warm-blooded animals. Carnivorous fish such as Salmon and Trout do not utilise carbohydrates well, and this part of the declaration often provides a misleading impression of the feeds content of energy and thus its value. When calculating the feeds content of gross energy, the content of NFE is fully included. This means that that one percentage point of carbohydrate and crude fibre almost contribute with the same amount of gross energy as one percentage point of the protein. Thus a high content of crude fibre provides a misleading impression of the feeds energy value. Also when calculating the more relevant digestible energy, NFE contributes to an inaccurate picture of the feed value. This is caused by the fish feeding business often using elevated numbers for the digestibility of NFE. Often calculations are carried out with 83-88% digestibility of NFE, despite the fact that this level of digestibility is only valid for the part of NFE which is made up of starch. Depending on the NFE-source, it would be more accurate to calculate with 50-55%. In connection with an update of our datasheets in 2015 Aller Aqua has adjusted calculations. This causes the content of digestible energy to be slightly reduced without any further changes in the feed or its performance. The numbers now give a better impression of the feed value. All feed deliveries, whether bags or bulk, must the labelled. For instance, labelling regarding the specific batch. Contrary to the datasheet the label is a legal document with strict demands for information and how they are presented. You will usually find more substantial and detailed information on the label compared to the datasheet. The information on the goods must reflect the specific batch of feed within certain legal frames. Despite this, the previous comments on declarations for protein and fat are still valid for the labels, which are not much use in determining the feeds potential performance either. As you can gather from the above, the declaration should just be considered a guide for the feed quality and performance, and can only be used for primary sorting of the products. So how do you make the final and hopefully right choice? You can draw on your own experience and that of others. You should also listen to the advice offered by feed producers. However, there is only one way to make the right choice, and that is conducting a thorough trial. Fearing complicated processes many farmers shy away from conducting trials, but it needs not be complicated nor difficult. Strictly speaking, this is the way any professional production cycle should be carried out. If possible you should run parallel and comparable units, with the same species in all units – ideally, you would have two units for each trial / feed type. This increases the chances of a valid result significantly. However, if it is not possible to have two identical units for trials, you should not give up. Reliable results can be obtained via repetition. This means carrying out the same trial repeatedly. Via the amount of trials you can obtain a reliable result of for example the performance of various feed types. After a successful trial or a certain amount of results, you have a qualified foundation for making your choice of feed. Aller Aqua is happy to contribute guidance for carrying out the trials, as well as processing of the results – including calculating economic conditions related to your wishes for production. The best economical result does not always stem from the lowest FCR or the lowest feed expense. Once you have a reliable result, you can make a qualified choice. This choice is, however, a snapshot of the current situation. In order to keep yourself and your feed supplier on your toes, you should continuously gather new results. Besides providing a basis for determining the best solution, the continuous supply of data ensures that feed manufacturers are aware of quality and required improvements. Trials often prove that a more expensive feed provides for the best economic result for the farmer. It is important that the feed manufacturers are made aware of the results and thus focuses on improvements. If this does not happen, feed development is often a matter of feed price, which eliminates progress. The above statement might be pushing things a bit , but nevertheless, trials often prove that either the most expensive or the highest performing feed provides the best results in terms of lower FCR and particularly higher growth rate – equaling increased production. The right feed can certainly positively influence your result.